What Does "Peace on Earth, Good Will Toward Men" Mean? At Christmastime we often hear or see the phrase "peace on earth, good will toward men" either in Christmas songs, television programs, billboards, or prominently displayed in some sort of Christmas decoration. We even hear it in church, because the phrase is based on the Gospel of Luke 2:14, which is often rendered: "Glory to God in the Highest, and on earth peace, good will toward men." This is the Angelic Hymn that was sung by a multitude of Angels on the night Christ was born, after appearing to poor shepherds that were watching their flocks in the fields of Bethlehem. Often this hymn is thought to be a benediction of peace either in some external or internal manner, so that either there will no longer be any wars or conflicts on earth, or that we have a sense of inner tranquility and calmness. Furthermore, it is thought to encourage kindness or good will between each other, in order for this peace to be achieved. This is the most popular understanding of the phrase. However, this popular understanding is in fact a significant misunderstanding, being more sentimental than theological. And the misunderstanding is first of all based on the fact that Luke 2:14 is often mistranslated from the original Greek. In the original Greek, Luke 2:14 is translated as: "Glory to God in the Highest, and on the earth peace among whom He is pleased." When we thus read what the text actually says, we see that the focus of the word "peace" is on the words "among whom He is pleased", after glorifying God. 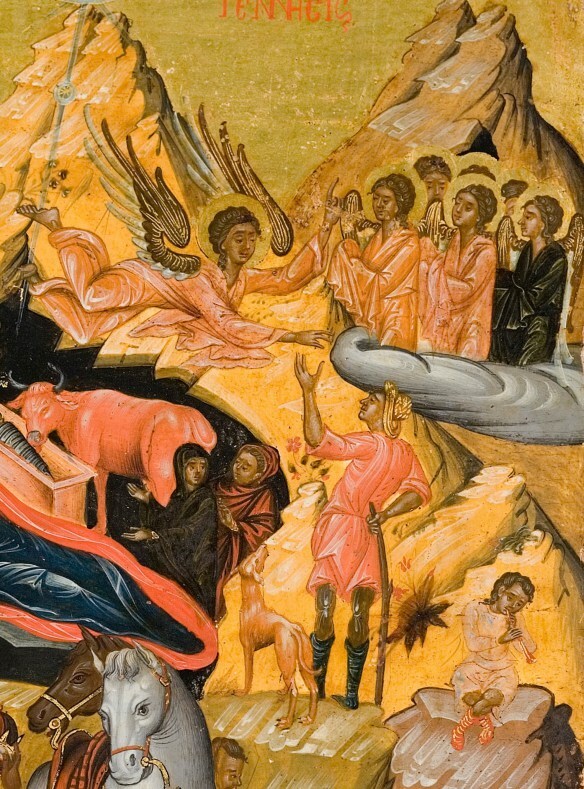 How should this change our understanding of the Angelic Hymn in Luke 2:14? "The 'peace' (ειρήνη) of which the angels sang at the birth of Christ is the union of the divine and human natures in the Person of Christ. Christ assumed human nature in His Person and deified it, by which all of human nature was brought peace from the consequences of the fall, and in this way every person was given the opportunity to participate in this peace, by living within the Church, with her sacramental and ascetic life. The Church is the 'place' in which man experiences the love and peace of God. The word 'good pleasure' (ευδοκία), according to Saint Nikodemos the Hagiorite, who used various patristic texts, such as Saint Maximus the Confessor, Saint John of Damascus and Saint Gregory Palamas, means that the reception of human nature by Christ was the original/prior will of God for the deification of humanity (according to the will of His good pleasure). The deification of man could not take place if there was not a hypostatic union of the divine and human natures, the uncreated and the created natures. However, the law through Moses, the words of the Prophets, etc. were imperfect (according to the will of concession) due to the fall, but were perfected through the incarnation of Christ. This is the difference between the will 'according to good pleasure' (κατ' ευδοκίαν) and 'according to concession' (κατά παραχώρησιν). The incarnation of Christ was the original plan of God, His good pleasure. What was introduced after the fall of Adam, was the Cross and death." "For the angels and archangels, thrones and dominions, and high above them the Seraphim, preserving their settled order, are at peace with God: for never in any way do they transgress His good pleasure, but are firmly established in righteousness and holiness. But we, wretched beings, by having set up our own lusts in opposition to the will of our Lord, had put ourselves into the position of enemies unto Him. But by Christ this has been done away: for He is our peace; for He has united us by Himself unto God the Father, having taken away from the middle the cause of the enmity, even sin, and so justifies us by faith, and makes us holy and without blame, and calls near unto Him those who were afar off. And besides this, He has made the two people [Jews and Gentiles] into one new man, so making peace, and reconciling both in one body to the Father. For it pleased God the Father to form into one new whole all things in Him, and to bind together things below and things above, and to make those in heaven and those on earth into one flock. Christ therefore has been made for us both Peace and Good-pleasure." In summary, therefore, the Angelic Hymn in Luke 2:14 is a glorification of Christ, Who as God has become man, and is Emmanuel, or God with us, and through His incarnation He has brought peace on earth by reconciling heaven and earth in His divine and human natures, and in turn reconciling with God all people that are pleasing to Him and strive to fulfill His will by keeping His commandments, for all this is the good pleasure of God.